Organized in Orléans – France on 30 March, this event aims to enable cosmetics sector personnel to fully align their production conditions and practices with ISO 22716 and regulatory requirements, and to prepare them for inspections by the ANSM [French health authority] and the DGCCRF [government consumer rights and anti-fraud body]. This Seminar on Quality in the Cosmetics Industry will seek to stimulate po­sitive thinking on current problems in the field of quality. Institutional and industrial angles will be explored in a spirit of cooperation and partnering, with the aim of reaching consensus and elaborating effective action plans. Participants will be given opportunies to discuss their experience and meet with specialists. Extreme practices compatible with regulations will be described, allowing each company to make its own decisions on a risk-analysis basis. 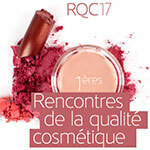 This Seminar on Quality in the Cosmetics Industry was born out of a partnership between companies of the cosmetics sector - members of the FEBEA [French Federation of Beauty Enterprises] and IFIS Cosmétique [the cosmetics division of IFIS: Training Insitute for the Health Industries].